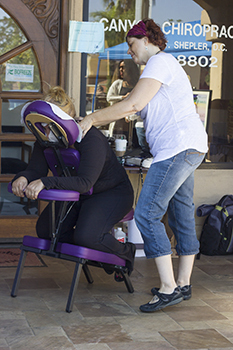 [KHTS] – Representatives from Kenneally Acupuncture in Canyon Country held their 9th annual Fall Seasonal & Festival on Sunday. More than 100 people attended the all day event, beginning at 9 a.m. and continued through 6 p.m. The Akashic Team soul reader Monique Hitzman and Angel Card reader Kimberly Barclay were available at the event along with certified Hypnotherapist Penny Randall among other local vendors. “This is a community event Kathleen’s vision of producing not only the acupuncture event but with her acupuncture practice, she has the Kenneally Healing Light Resource Center and through that center they produce the Fall Seasonal,” Benoit said. The event was open to the public and is held four times of year, at the beginning of every season. Community professionals who are involved in the healing arts participated in an all day lecture series at the event. When you walk through the doors of Kenneally Acupuncture and Healing Light Resource Center you feel an immediate sense of peace and relaxation. By combining several modalities under one roof, people have the opportunity to optimize their health and well being. Our team of health professionals and staff are dedicated to helping people achieve wellness on all levels. In this warm, caring, safe and healing environment, children and adults can experience the highest quality of holistic healthcare available in the Santa Clarita Valley. Owner and Licensed Acupuncturist, Dr. Kenneally started her practice over 12 years ago and has lived in the Santa Clarita Valley for over 20 years. She comes from a family of Doctors and medical professionals and has been involved with many areas of healthcare over the last 25 years. She is a Master of Oriental Medicine, Reiki Master Practitioner, and has completed advanced training in Classical Five Element Acupuncture, and NAET (Nambudripad’s Allergy Elimination Technique). Kathleen’s specialties include allergies, women’s issues, acute/chronic pain, emotional clearing/balancing and seasonal immune system treatments.